Blarneystone Miss Valdez, F. Ch. Photos © 1999 Cathy Wilson. All rights reserved. 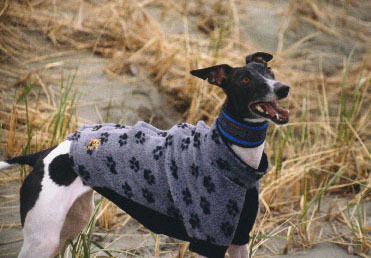 We got her through a Whippet rescue organization in Olympia in February 1999. Her previous owners were moving and didn't want to take her with them. We can't imagine why anyone would want to give up such a sweet, lovable dog! 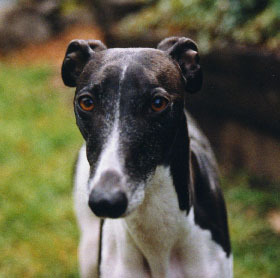 For those who asked, yes, we did get another whippet. But one wasn't enough. So we got another. Then Mamba died (he was old), so we got yet another. Then Pixie died. I enjoyed spending time with just Snazzy for a while. But now Snazzy's gone, so it's just Cherry for now. Background © 1999 Cathy Wilson. All rights reserved.